Hey everybody, look what I have just found. At first glance, this may look photoshopped, but it is actually a real sculpture! The author is Tsang Cheung Shing from Hong Kong. 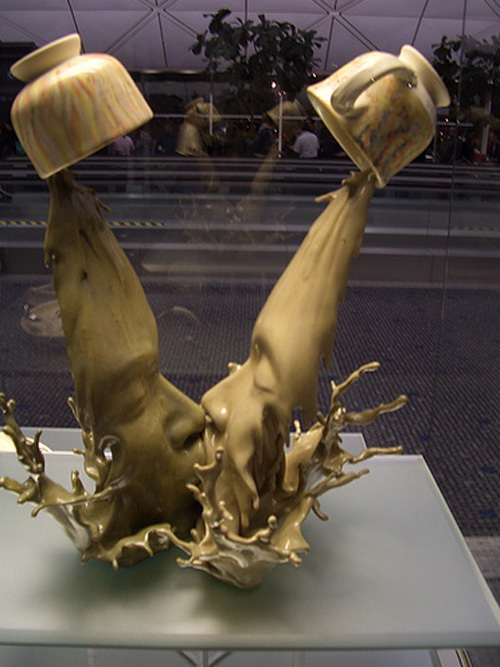 He created this installation for a pottery exhibition of “YingYeung” – a drink mixture of coffee and tea (very popular local drink in Hong Kong). 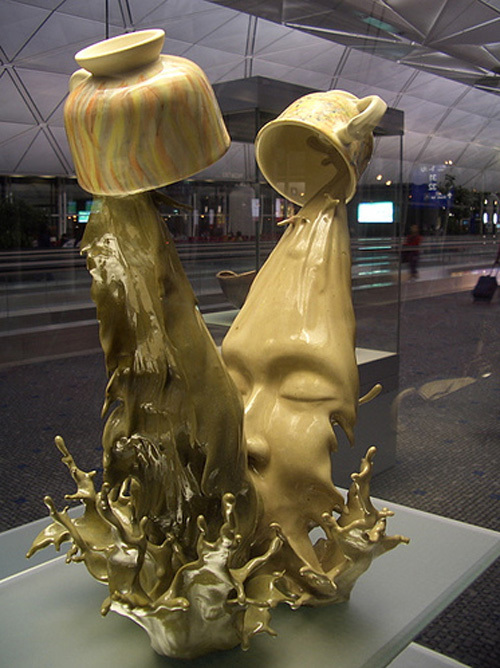 The pottery, named Yuanyang II, is one of the collections of Hong Kong Museum of Art now displaying at the Central Concourse of Hong Kong International Airport (HKIA). Tsang Cheung-shing is a ceramic art tutor and product designer. Yuanyang II is modeled in a distinctive form with two figures indulged in kissing each other. Their heads support two elegant cups for drinking tea and coffee. The form and concept design fully complement the theme “Yuanyang” not only typical Hong Kong beverage of mixing tea and coffee which was already mentioned, but also a symbol of marriage and love. Hope you liked this post! Two more photos can be found inside the article. Wow that is awesome… id love to have that as my dinner table center piece. amazing! i wonder how he got the splash to look so real. This is more than just awesome… This is absolutely fabulous!!! I just love it! T.S.Shing is a genius! Yes, it is neat and cool, but how is this an illusion? Cool, yes, but why is it an illusion, and why would someone suspect it would require photoshop to make this sculpture? I think this is very cool! I LOVE IT! An interesting design, very cool affect with the splash looking so real. Tharene why are you so negative i mean what is your problem its an awesome optical illusion infact i would even kill a man for it to be on the table. anyway, that is the most amazing sculpture i have ever seen. so realistic! 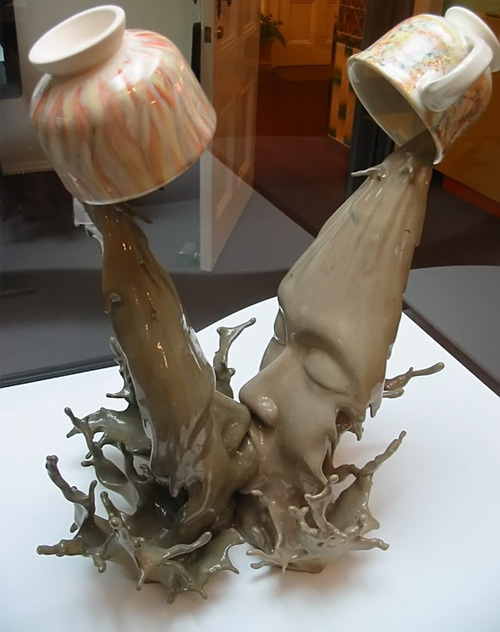 i’ve seen spilled coffee statues before, but never as cool as this! Very nice! Is it made out of clay, wax, or glass? I’d understand the splashes if it was clay or wax, but to be made out of clay is just unbelievable! Am I the only one who thinks it’s hideous? Its an illusion because it looks like coffee spilling but its not. Also, even if it was coffee spilling it wouldn’t have two faces in it kissing. Even if it wasn’t who cares? Do you have OCD or something? The content of every site doesn’t have to match the title perfectly. Yes…it is extremely kitsch. It is not something I would put in my living room either. However, it is very well executed. I wouldn’t consider it an illusion, though at first glance it is difficult to figure out whether it is real, photoshopped or sculpted. Hi people, i actually think it’s pretty ugly. Im not bashing the artist because that takes some MAJOR talent, but it’s a little tacky. Sorry! not really an illusion, but awwwwwwwsome sculpture!! wow, that’s so cool, i love it! What else next can He come up with. I WANT IT!!!! I wonder if he makes replica’s? That is so beautiful and a great amount of thought had to go into creating such a masterpiece. Keep up the good work. The world needs more people like you. Very Beautiful!! It makes me want to turn into coffee! WOW. The splash IS so real! How does the cup balance? Does anyone know if there is anywhere to purchase a replica of this statue? I would love one of these for my house. Could it be possible to use this wonderful image for a book cover (a friend of mine is going to publish a poetry book) Is there a way to make it? I like my coffe the same way I like woman sweet with a little cream. If I were rich (big if) I would have no problem dishing out a few million for this. This is what I consider to be true art and it speaks to me!!! I love it. Bottom line, I have seen true crap, I mean the big feces thing… UGH go for serious amounts of cash, I don’t see why this one deserves less. It deserves MORE! That is weird, even if I was the richest dude in the world I still wouldn’t buy it.